Although I’m a Savannah local, it’s been a while since I indulged in a day of exploring the city’s mystical treasure-troves. Savannah’s antique stores have so much to offer, from the locations, to the eclectic wares, to the hospitable owners, these shops are like a constantly unfolding story. In one store, I’m bound to uncover a shimmering clutch purse that reminds me of my grandmother’s beautiful accessories. At another, I’ll lose myself in the aromas of hand-cut soaps while sipping a latte and indulging in a fresh-baked croissant. At yet another, I’ll find that perfect mix of new and old pieces to bring immense amounts of character to my home. If you love hunting for the perfect hidden gem as much as I do, come explore some of the finest vintage, antique, restored, and collectible shops Savannah has to offer. When you stroll through Picker Joe’s Antique Mall and Vintage Market, you should be prepared to not only delight in everything you’ll see, but also have a really good, nostalgia-filled time. Owner Jim Plumlee, a former auto mechanic and part-time air-show pilot opened Picker Joe’s just over three and a half years ago. In fact, it was his pilot gig, and his affinity for old instrument gauges, that prompted a neighbor to ask him, “have you ever thought of getting a booth?” So he did. He got his own spot in a larger antique mall and along the way discovered his passion. “I LOVE going to work every day,” says Plumlee. “It’s like our slogan – an experience like no other – it changes all the time.” He said of all the praise he hears from his customers, the comments he hears most often are: it’s clean, it’s neat, it’s organized, and the energy is like no other mall they’ve been in. With Big Band music playing in the background and 65 individual dealers in addition to Picker Joe’s own selection, prepare to de-stress and experience unprecedented retail therapy. 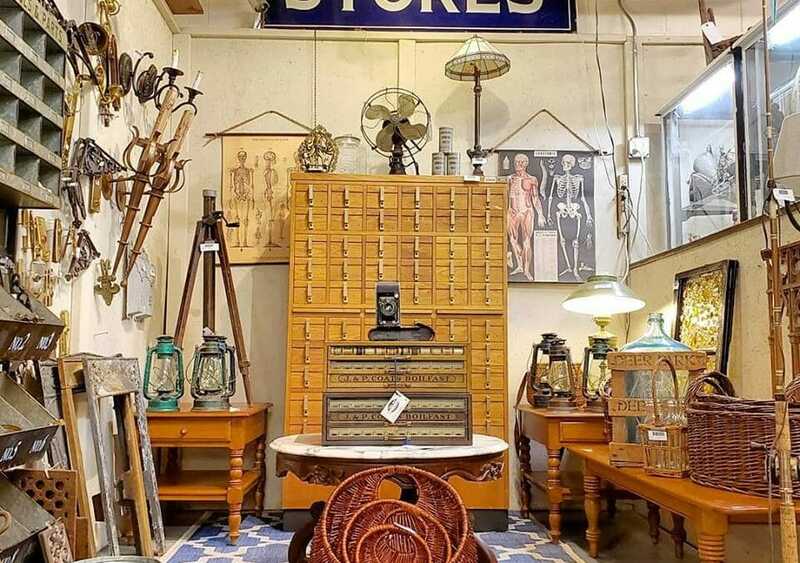 “I have PFTP,” said Plumlee in a spirited tone, “Passion for the Past.” Beyond aviation finds, Plumlee also has a passion for architectural salvage and will soon expand his back room by 300% just to house those specific finds. Be sure to visit their Facebook page where they have 360 degree photos to give you a virtual feel of all you’ll see in person. Now on to a shop whose motto is simply, “if you need it, we don’t have it, but if you want it, we’ve got it.” Welcome to Wright Square Vintage and Retro Mall. As its name suggests, this is not a one-owner type of store, but rather hosts 32 dealers within its space to ensure there really is something for everyone. “Every dealer has their niche of something they do well,” said Andy Sher who, along with Joe Weaver, co-owns the shop. “We have some dealers who specialize in record albums, others who only carry vintage cameras and others who do vintage clothing.” Sher kindly explained the difference between antique and vintage to me, “an antique piece has to be 50 years or older but vintage or retro pieces are words that indicate something ‘not new’ and resonate with customers.” In many ways, Wright Square Vintage and Retro Mall is like the Smithsonian, “you can spend five years looking at all of our booths,” described Sher, “but most customers don’t just wander in. They’ve done their homework and we’re on their ‘to see’ list of places they want to go,” and he adds, “it’s a short list.” Sher knows the store and its dealers like the back of his hand and not only guides customers, but also tries to lend some local advice on what to see and do while in Savannah. “We sell a lot of copies of Midnight in the Garden of Good and Evil, first editions and even signed copies, and if a customer buys one, I ask how many days they have left here and then I try to guide them as to what to do to ‘live’ the book,” said Sher. Eclectic finds and a tour guide to boot? Sounds like Wright Square Vintage and Retro Mall is a great stop for every visitor. The next shop is best described by its owner, Renee Slipko: “GCD Home Furnishings & Décor is located in a quiet part of downtown Savannah. You enter the shop through a 10-foot red barn door and into a large, open loft with exposed Savannah gray brick walls, a wood-planked ceiling and massive steel industrial support beams.” This is the type of shop where you could spend hours browsing, exploring, and discovering. GCD offers customers countless vintage and new items, as well as a selection of antique pieces (some more than 100 years old). Their full offering includes furniture and home accents with an emphasis on affordability and eccentricity. “The range of products is as surprising as the affordable prices are,” Slipko, who owns GCD with her husband, Robert, told us. “Available items include a line of imported antique and vintage Persian rugs, new mid-century modern furniture, imported hand-dyed Kantha quilts, pillows, floor poofs, vintage and new artwork….” The shop also hosts a revolving art exhibit with different local Savannah artists every month as well as one-of-a-kind jewelry, seasonal and upcycled signs, and hand-crocheted blankets. During the holidays, GCD is offering free gift-wrapping on all purchases along with several tiered add-on “bonus items” where the more you spend, the more you get. GCD will also be doing a holiday raffle so be sure to check their Facebook page for updates. Just outside of Savannah’s downtown district is the community of Sandfly and our next stop: a 16,000 square foot space called Sandfly Market. “We are the largest antique mall in Savannah with an ever-changing, eclectic selection of antiques, primitives, mid-century, rustic and unique finds,” described Amber Lair who co-owns Sandfly Market along with Krystle Venticinque. A visit to Sandfly Market provides you with an opportunity to both purchase historic pieces and explore historic surroundings. Sandfly is located near Isle of Hope at the intersection of Montgomery Crossroad and Skidaway Island. The community was established by African Americans in the nineteenth century, many of whom were former slaves of the nearby Wormsloe Plantation. “We tell our customers to plan a day trip in downtown Sandfly and visit our shop, followed by lunch at a local restaurant or café and after lunch, they can head on over to historic Wormsloe plantation followed by a stroll down beautiful Bluff Drive,” recommended Lair. Wormsloe, the colonial estate of Noble Jones who was among the first Savannah settlers from England, is known for its breathtaking Live Oak entry that is a natural canopy of centuries-old limbs and Spanish moss. Today, Wormsloe is a state historic site and offers programs, events, a museum, and interpretive nature trail for visitors to enjoy. A visit to Sandfly Market is a great way to immerse yourself in history. “Savannah truly gives you the full experience of living in the past, and what better way to take a piece of Savannah home with you than with antiques?” said Lair. “We have a team of about 30 vendors who travel all across the US to bring back one-of-a-kind, hand-picked items,” Lair told me. If you happen to visit Sandfly Market in December, you can feel extra-good about your purchase as part of their annual charity event. Shoppers can even expect sales from 10-40% off for the month of December. Find out more about their charitable giving and view photos of their selections on their website. As you countdown to the gift-giving season, why not skip the crowded box stores and bland online-shopping, for a gift discovery excursion? If you’re planning a Savannah trip anytime soon, be sure to bookmark post for easy reference. Trust me, you won’t want to miss a single shop!